They’ve started gritting the roads near my house and whenever my dog walks on the pavement his feet get sore. Is there anything I can do to prevent this? Ouch! Unfortunately, salt and grit can be pretty uncomfortable for doggy paws and it’s best to avoid areas that have been gritted wherever possible. There are some options if you can’t avoid it completely, such as doggy boots or paw wax to try and protect sensitive feet. I’d recommend getting your dog used to having his paws checked regularly so you can pick up on any problems as soon as possible. My dog seems really itchy at the moment and just won’t stop scratching! Is there anything I can do to help him? Oh dear, poor chap! There are lots of things that can make dogs scratch and it’s really difficult to advise on treatment without being able to look at him. Firstly I’d say to make sure he’s up to date with a good prescription flea treatment. The products that you get from the vets are better than those you can buy in pet shops as they will be stronger and usually treat other creepy crawlies that can be on the skin, such as mites (mange) or lice. If you are all up to date with flea treatment, then it could an allergy to something in his environment or even food. If he’s still scratching, then the next step is a check over at the vets. Sometimes we’ll do some tests there and then, such as taking a skin scrape to check for mites or bloods for allergies. 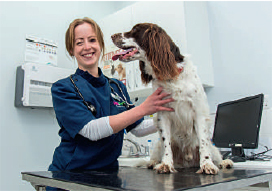 There’s a variety of medication and treatment options out there and your vet will be able to advise you on the best plan for you and your dog. My cat has a weepy eye and it just isn’t getting better. She seems fine in herself so do you think I need to get her seen? There can be lots of things that can cause a weepy eye in cats and I’d always recommend that you visit your vet to get it checked out. It could be a simple conjunctivitis but the vet will give your cat a thorough examination and check that there isn’t a scratch on the surface or something stuck behind the eyelids or anything else that could be causing a discharge. I’m always very cautious when it comes to eyes and I’d rather have a good look to make sure that nothing else is going on as eye problems can quickly deteriorate.